Guys. It's already September. I can't even begin to believe it. Even though it is still in the 90s here in Southern VA, you can see the subtle reminders that autumn is coming. The tree outside of our kitchen window is slowly starting to turn gold, and guys...most importantly PSL is back. Moment of honesty. I didn't really accomplish any of my goals for August. So what I'm going to do is make them my goals again for September. Problem solved. 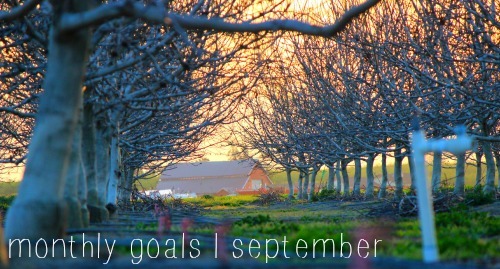 So here are my goals for the month of September! Drink 2 water bottles per day. Though I have been more conscious of this, I'm still feeling very dehydrated lately. I am stretching this goal to include things like unsweetened iced tea and crystal light (0 calories, 0 sugar). Actually exercise. I've talked a couple time about how I'm committed to a race on Sept. 20. Well I'm not going to run in it. I'd probably die. It is a 10k and I am in no shape to do that and then work all day after. But I am still committed to starting a 2-3 day per week exercise plan, once I sign up at Planet Fitness. Wake up earlier. Really this means I just need to get on a better sleep schedule. Go to sleep at a regular time (and put the phone away), and then wake up a little bit earlier in order to not be so rushed in the mornings. Sponsor some blogs. I feel like I'm ready to start increasing my reach in readership, which means I need to sponsor some blogs I love. I created some more buttons, and I just need to take the leap and do it. I'm not sure why I haven't done this yet! Love your water goal! I'm trying to drink more water too, and man its tough! You just don't think about it until your super dry. I'm trying to get three litres in a day. I'm getting no work done because I'm always peeing! The benefits outweigh the negatives though, my usually oily skin is looking divine. Three liters! Wow girl! I'm glad to hear that it is helping your skin though. I have been really struggling with my skin, and I hope that it will help that!